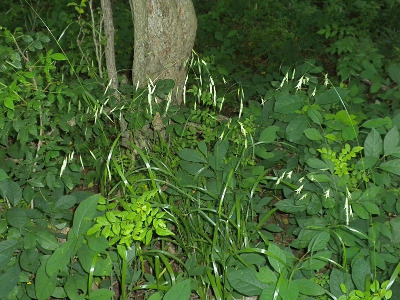 Included in B. pubescens in Michigan Flora. Rich hardwood forests, usually near streams, but often above the lowest, wettest river bottoms; occasionally in drier forests on banks and slopes. This species is readily distinguished from B. pubescens in the field by the satiny sheen to the undersurface of the leaf (which, however, appears uppermost due to the 180 degree twist that leaves of so many grasses show). In addition, the flowering season is later, with anthesis in southern Michigan being in mid- to late July, versus usually mid- to late June for B. pubescens. See McKenzie & Ladd (1995) for more information. In the herbarium, distinctions are more difficult. The satiny sheen can be very hard to discern and the pubescence is also somewhat variable. The often cited glume venation differences do not work well with Michigan material. MICHIGAN FLORA ONLINE. A. A. Reznicek, E. G. Voss, & B. S. Walters. February 2011. University of Michigan. Web. April 19, 2019. https://michiganflora.net/species.aspx?id=2835.